qualitative findings for the role of amines/ammonia and (highly oxidized) organic compounds for the early growth of particles. As a results of this work essential contributions have been achieved in the understanding of the process of H2SO4/H2O particle formation (Berndt et al., Science, 2005; Sipilä et al., 2010; Petäjä et al., 2011), the importance of amines/ammonia for the rate of particle formation (Berndt et al., 2010) and the role of the reaction of stabilized Criegee Intermediates with SO2 (Mauldin et al., 2012). 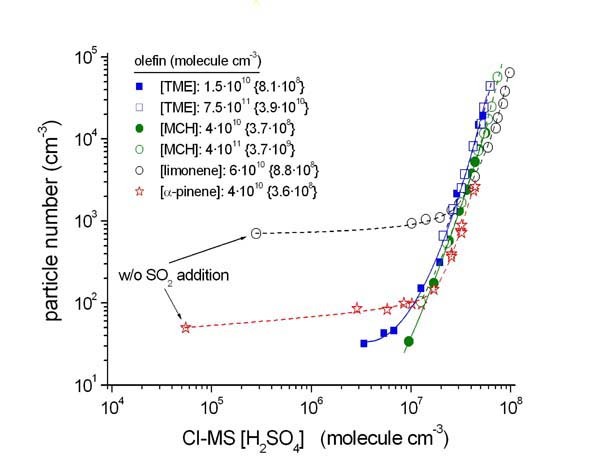 The following figure shows an example of formed particles from the ozonolysis of a series of olefins in the presence of SO2 (variation of SO2 and consequently of H2SO4 for constant concentrations of O3 and the olefins). The amount of reacted olefin is given in brackets beside the inital clefin concentrations.